Why is it so hard to find fun activities for teaching writing? Maybe I’m not looking in the right places. Anyhow, I’m currently teaching an academic writing course to a group of 16 students and I have definitely felt challenged in thinking of ways to make this class not only meaningful, but also fun and kinesthetic. I mean, students are expected to learn to write, so most of the time they are sitting. Nevertheless, I’ve come up with a couple of ideas that I consider are worth sharing, just in case there are teachers out there feeling stuck like I have, and also, so I won’t forget them. Today I’ll share a warm-up activity I came up with for getting my students to understand how to make argumentative thesis statements for an essay they will be writing the following weeks. It’s a simple activity, really. I typed a couple of controversial issues that weren’t too sensitive and a sign for IN FAVOR and AGAINST. I printed them in color paper and cut them up (see picture). 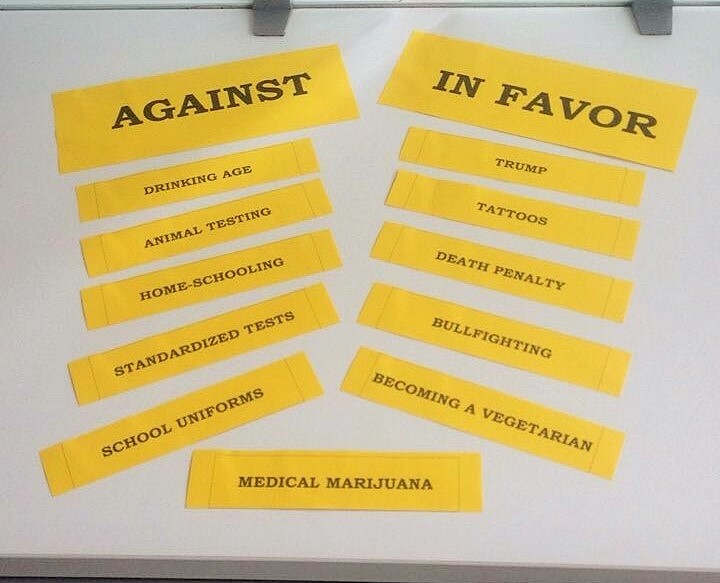 In class, I taped the IN FAVOR sign on one side of the board and the AGAINST sign on the other side. I asked students to stand up an come to the front of the room. Then, I showed them one of the issues and stuck the paper with on the board between the IN FAVOR and AGAINST signs, so students would keep in mind what we were discussing. 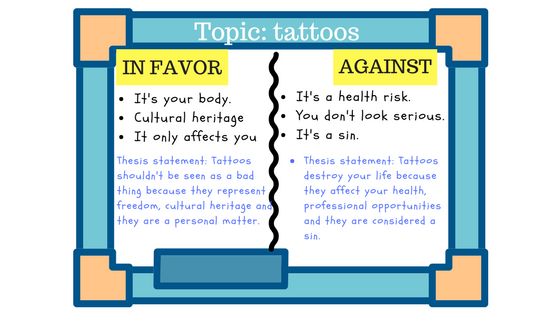 As I showed each issue, for instance tattoos, each student had to choose whether they were in favor or against the issue and move towards the end of the board that corresponded to that position. Then, in the groups that formed (in favor or against), they were asked to discuss the issue in order to find three arguments to support their position. They were given 2 minutes to discuss and write the three arguments (in key words) on the board. When time was up, they were asked to write the thesis statement. Then, someone from each side (for or against) was asked to explain the groups position and arguments and finally read the thesis statement. The activity took about 20 minutes. I really liked this activity because it allowed students to share experiences, their positions and anecdotes. It was truly a simple activity to plan and very fun to do. Here’s a design I made of the activity (since the photo did not come out as I expected). At the end of this warm-up, students said the structure of the thesis statment was a lot clearer and said they had “fun”. They made some good thesis statements and we had a laugh with some of their arguments. They seemed to be enjoying the activity so much, that when I said it was time to move on, they even asked me to show them one more issue so they could continue. Great! 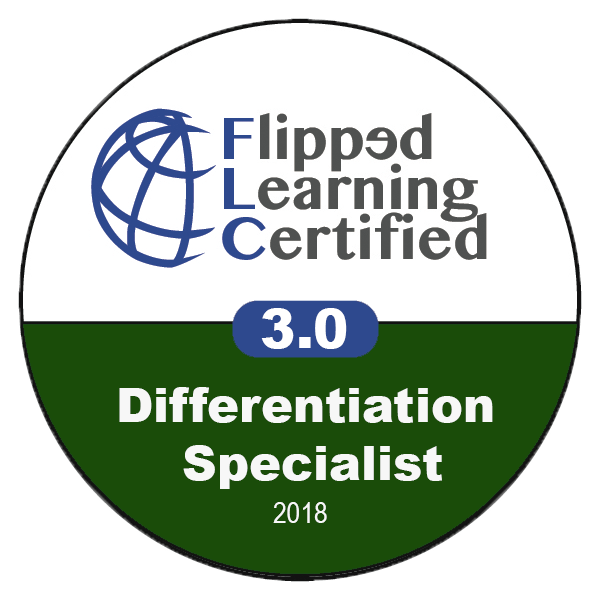 Of course, time was up and other tasks were in line, but I was happy with the result and the overall rapport with the activity. This is definitely an idea I will use again. Wonderful Martha, I think it’s a way to teach them writing while being actively involved and engaged. Thank you for sharing! Very creative! I got inspired to teach writing in a fun way. Thank you Martha. Wow! How wonderful! I would love to hear your ideas too. Nice!! Love this fun way to teach writing.